at the station in Pavlovsk, near St. Petersburg, Russia, Thursday, Aug.
grain they were saving for future generations. Now the Vavilov Institute of Plant Industry’s seed bank is in danger again, this time because of court-approved plans to rip up its vast fields of genetically diverse plants and build fancy homes on the prime real estate they occupy near St. Petersburg. St. Petersburg, Russia, Thursday, Aug. 19, 2010.
near St. Petersburg, Russia, Thursday, Aug. 19, 2010. Station in Pavlovsk, near St. Petersburg, Russia, Thursday, Aug. 19, 2010. 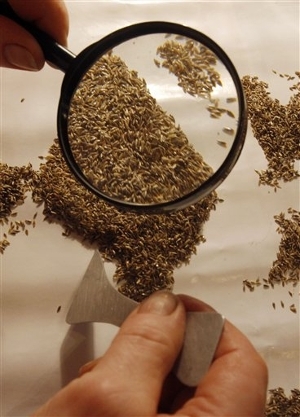 An employee sorts seeds of Phalaroides Arundinacea grass in the Pavlovsk Agricultural Station in Pavlovsk, near St. Petersburg, Russia, Thursday, Aug. 19, 2010. 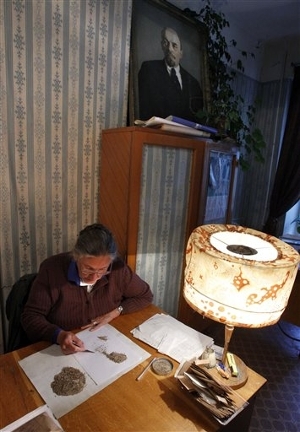 Employee of the Pavlovsk Agricultural Station Svetlana Ionkova sorts seeds in the station, with a portrait of Soviet state founder Vladimir Lenin on top, in Pavlovsk, near St. Petersburg, Russia, Thursday, Aug.
Head of Pavlovsk Agricultural Station Fyodor Mikhovich gestures speaking in Pavlovsk, near St.Petersburg, Russia, Thursday, Aug. 19, 2010. The world’s first seed bank survived World War II thanks to 12 Russian scientists who chose to starve to death rather than eat the grain they were saving for future generations. Now the Vavilov Institute of Plant Industry’s seed bank is in danger again, this time because of court-approved plans to rip up its vast fields of genetically diverse plants and build fancy homes on the prime real estate they occupy near St. Petersburg. 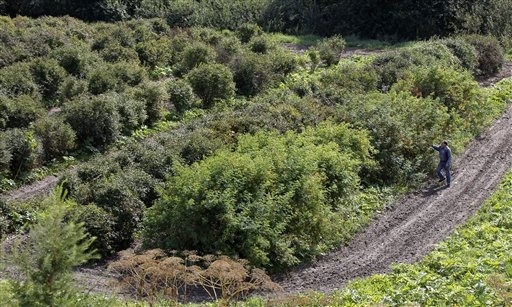 International organizations dedicated to agricultural diversity have appealed directly to President Dmitry Medvedev to save the Pavlovsk Agricultural Station, which they say could be crucial for sustaining fruit crops around the world as climate change and other threats weaken existing varieties. auction block on Sept. 23, scientists worry that a decision may come too late. “If we lose those lands … many kinds of plants will become extinct forever,” said Fyodor Mikhovich, head of Pavlovsk Agricultural Station. currants. It also has a rich variety of grasses and grains, though the institute’s larger grain fields are located elsewhere. As many as 90 percent of the plants are no longer found anywhere else in the world. Most of them are old varieties no longer in use, but the Vavilov Institute maintains them in case they will be useful in the future for developing new varieties. Moving the plants to other fields is not feasible, said Sergei Gandrabur, an agronomist at the station, as he looked out over sprawling strawberry fields this week. He said the plants have thrived on these lands, which are well protected from wind and flooding, and might not survive being transplanted. While the strawberries have already been harvested, the fruit is now ripening on long rows of plum, apple and pear trees. The federal fund that oversees residential housing construction won court approval this summer to take over the land, which it insists contains nothing of value. 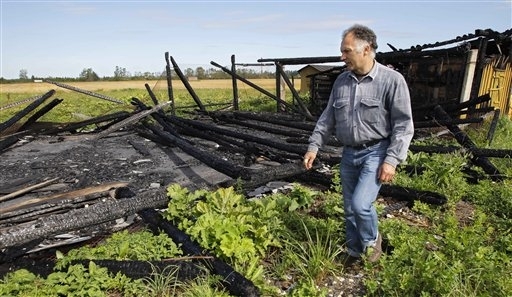 Fund spokesman Andrei Tikhonov said specialists visited the site several times and found nothing but weeds on one land plot and mowed grass on the other. “They probably do have this unique collection, but not on our land plots,” the spokesman said. He said the agricultural station had petitioned three years ago to use the same land plots for housing development, but was denied. 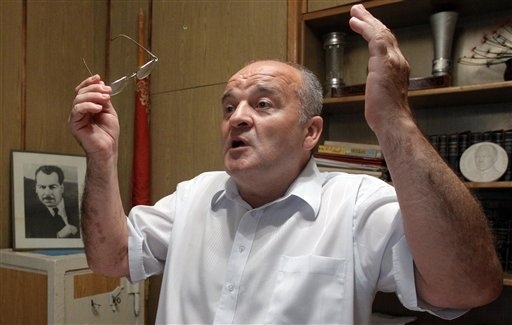 Tikhonov accused the station’s management of being motivated by its own commercial interests. Medvedev sent a message on his Twitter page last week saying he “gave the instruction for this issue to be scrutinized.” The government Audit Chamber said Friday that it was meeting Aug. 27 to decide how to proceed. 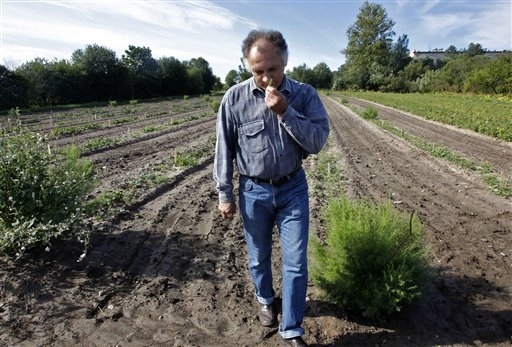 An international appeal to save the Pavlovsk fields was organized by the Rome-based Global Crop Diversity Trust, which launched a “Tweet Medvedev” campaign and put together a petition, which it said was signed by thousands of people all over the world. Bioversity International, also based in Rome, said its general director wrote to Medvedev asking him to intervene. 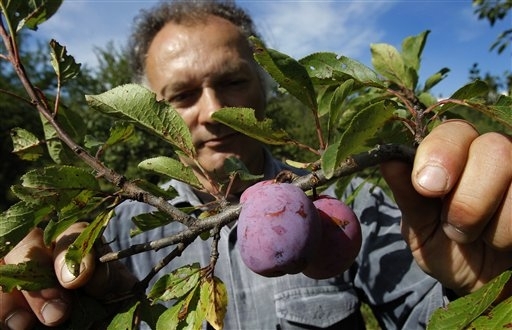 “The fruit and berry varieties that have been stored and studied at Pavlovsk since it was founded have a vital role to play in the future of Russian and global agriculture,” Bioversity general director Emile Frison said on the organization’s website. “The casual decision to destroy Pavlovsk station would forever tarnish a cause that generations of Russian plant scientists have lived, and quite literally, died, to protect,” Fowler said on the foundation’s website. The station was founded in 1924 by Nikolai Vavilov, a Russian botanist and geneticist who created the idea of seed banks as repositories of plant diversity that could be used to breed new varieties in response to threats to food production. starvation but did not touch the seeds of grain and other crops that could have sustained them, institute spokesman Sergei Alexanyan said. Hundreds of thousands of residents of St. Petersburg, known then as Leningrad, died during a 900-day siege. Vavilov himself died of malnutrition in prison in 1943, having criticized the anti-Mendelian genetics concepts of Trofim Lysenko. But Russia has since elevated him to hero status.